Written on November 25, 2014 . Posted in Announcements + Updates, Liberal Arts. For the final class of Writing+, the audience is our honored guest. During the semester, we have invited RISD faculty Sandy Gourlay, Mimi Cabell, and visitors John Cayley, Kenneth Goldsmith, Nick Montfort, and Amaranth Borsuk to speak in our open classes. We began to notice the quality of our diverse, invested, curious audiences. How could we tap into that creative and intellectual energy, beyond the Q&A and social huddle at the end of a talk? In our final class, we will loosen and shift the hierarchies of the open class. 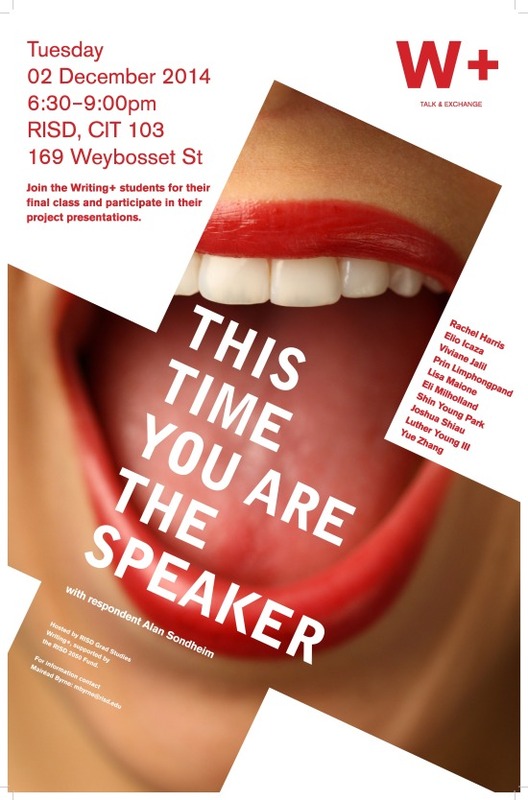 Rachel Harris, Elio Icaza, Viviane Jalil, Prin Limphongpand, Lisa Maione, Eli Milholland, Jennifer Park, Josh Shiau, Luther Young III, and Yue Zhang will present their individual and collaborative class projects (the speaker series is our collective project). Audience members will be invited to write, speak, engage. We will have food and drink. Alan Sondheim, who will listen and observe throughout, will sum up. Please join or rejoin us, and bring a friend. Writing+ is a RISD Graduate Seminar with the twin goals of imagining writing in the future and investigating writing in art + design. Supported by the RISD 2050 Fund. For information contact mbyrne@risd.edu.